Get essential information on Benghazi that one may find assembled and analyzed in few if any other places, at the Gulag Bound tag: Benghazi. Hillary has blood on her hands, has lawyered up — and is using foreign media sources to make her case. The State Department’s insistence it never bought the story – expressed by the White House and Susan Rice, U.S. ambassador to the United Nations – that a crude anti-Islam film made in California triggered the attack gives ammunition against Obama both to the Romney campaign and congressional Republicans. State Department sources have said that Clinton has never forgotten that Rice, who served in her husband Bill’s administration, was an early supporter of Obama. Rice has ambitions to take over from Clinton if Obama is re-elected but the Benghazi debacle could scupper her chances. In a briefing on Tuesday, State Department officials said ‘others’ in the executive branch concluded initially that the attack was part of a protest against the film, which ridiculed the Prophet Muhammad. That was never the State Department’s conclusion, reporters were told. No confession was apparently offered by the State Department about the hunt for MANPADS, or to more broadly answer the question: What in the world were those Americans doing in Benghazi with such paltry security? Can you say “Welcome, One World Order” ? 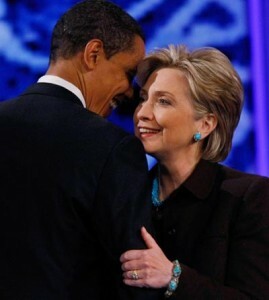 Obama is a disciple, Hillary is going for High Priestess, and America will be thrown into Hell by them with no honor.